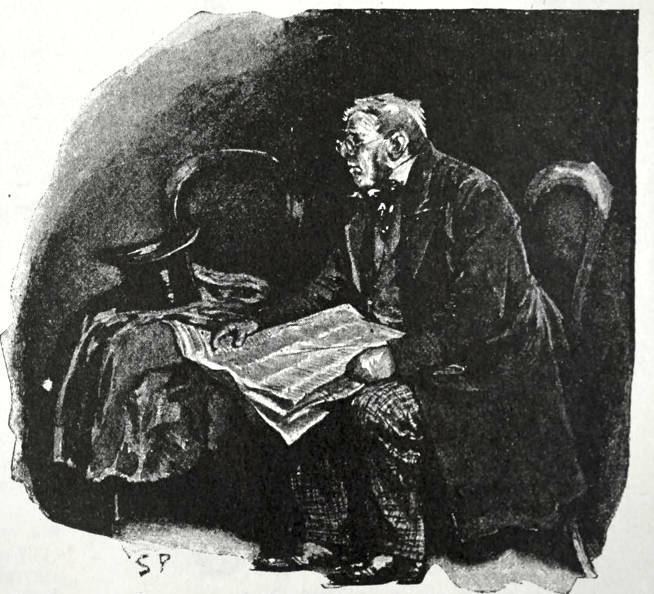 A detail of Robert Barnes's illustration for Thomas Hardy's The Mayor of Casterbridge; click on image for comlplete plate. Trousers during the 1850s might widen somewhat at the ankle but on the whole a tubular shape prevailed, and both styles, if in plain material, were often braided down the side. In 1857 trousers gathered into a narrow waistband with a strap and buckle at the back were introduced; known as American trousers, they could be worn without braces, and led to the waistcoat being discarded for informal wear in the 1890s, particularly in America, and to the wearing of belts with trousers. Trouser length varied from the ankle to over the instep, but by the 1860s the strap under the foot was uncommon. Peg-top or zouave trousers for day wear between 1857 and 1865 were cut wide at the hips, tapering to a close fit at the ankles; these never became a universal fashion, aithough a modified version was re-introduced in the 1890s with more success. 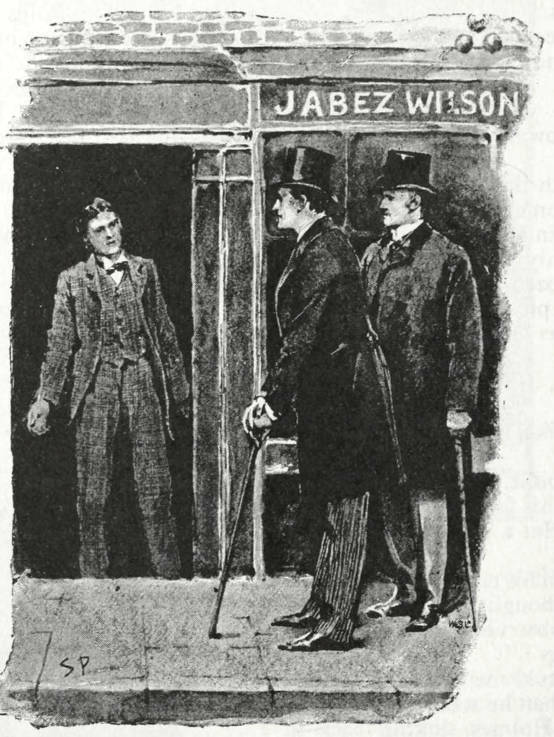 Between 1865 and 1890 variations in the cut of trousers were slight; during the 1870s they were of equal width at knee and ankle; in 1881 'tight slacks' were tight at the knee and loose at the ankle, and around 1884 eelskin masher trousers were excessively tight, probably favoured by 'mashers', the 1880 -90 name for a dandy. The invention of the trouser-press in the 1890s facilitated the fashion for a crease down the front and back of trousers, and the turn-up at the ankle and hip pockets at the back, sometimes called 'caddies', also appeared at this time. 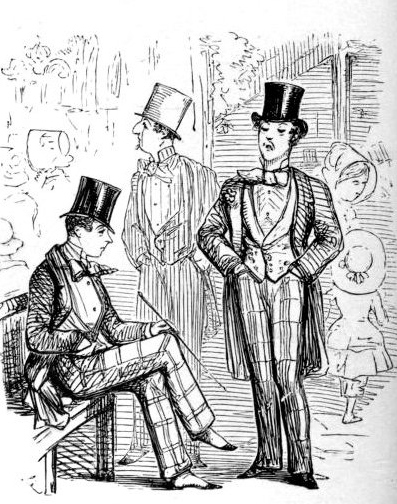 John Leech of Punch on the fashion for gaudy patterns in men's trousers. 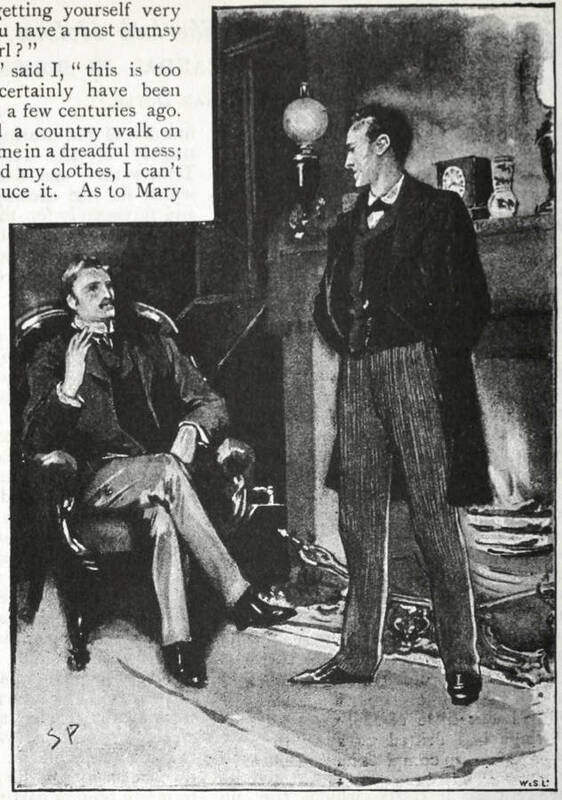 Left: Elegant Habit. Middle: A Most Alarming Swelling [The title refers to the young “swells,” or men about town. . Right: Young England. 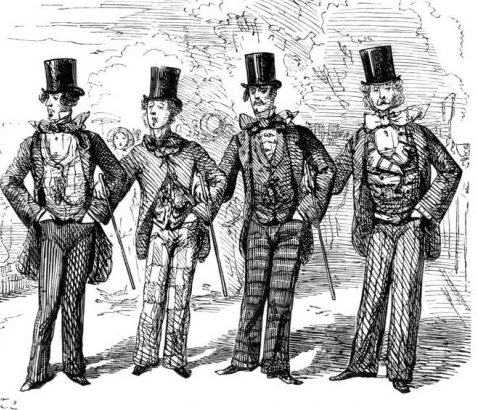 During the 1860s trousers in plaids and checks were often worn with dark coats, and grey striped fabric found increasing favour for wear with formal day coats, while white flannel became correct for cricket and boating. 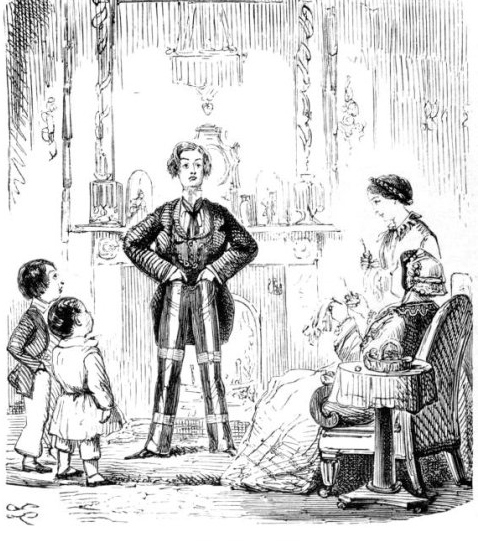 Clergymen and footmen in wealthy households wore breeches long after most men wore trousers: A detail of an illustration by George Du Maurier; click on image for comlplete plate.